Earlier this month, I attended the quarterly National Conference of State Historic Preservation Officers (NCSHPO) Board of Directors meeting as a member of the Executive Commitee. Ramona Bartos (North Carolina) led a great NCSHPO strategic planning session for the upcoming five years based on a survey of the membership. Several facts from the survey struck me. For instance, while 55 percent of the SHPOs/DSHPOs had five years or less tenure in their positions, 70 percent had 16 years of experience or more in historic preservation — indicating that we have some pretty experienced hands at the national leadership level. Best practices and information sharing were two of the services most used by members, along with current legislative reports. Generational change and workforce diversity were noted as challenges faced by a majority of respondents, along with knowledge transfer. NCSHPO’s mentoring program which started several years ago, in which Executive Director Erik Hein matches incoming SHPOs/DSHPOs with a more experienced executive was very popular with regard to these issues. It was good to learn that HPD shares many of our challenges with our colleagues in other states! Also this month, HPD held an internal brainstorming session using the Emergenetics WETeam framework. The session focused on developing a draft one-page checklist document that DNR Law Enforcement Division first responders can use when they inspect DNR historic sites following a critical incident like a hurricane or tornado. The checklist will ultimately be included in DNR’s All Hazards Manual, which serves as guidance to operationalize the Incident Command System. Inclusion of HPD in the All Hazards Manual for the first time is just one of several steps; as I have noted in earlier editions of this newsletter, HPD’s role in critical incident response/recovery will be changing over the coming year, with more developments to come over the next six months or so. The Georgia Historic Preservation Division will host its semi-annual meeting of the Georgia National Register Review Board on Friday, August 25. The meeting will be held in the Georgia Department of Natural Resources Boardroom, located in the East Tower of the James H. “Sloppy” Floyd Building, at 2 Martin Luther King Jr. Boulevard in downtown Atlanta. The complete agenda, short summaries of each proposed nomination, and other details can be found on HPD’s website. If you plan to attend, please contact Christy Atkins at christy.atkins@dnr.ga.gov. This meeting is an important step in the multi-phase process that leads to National Register listing. Nomination sponsors have been working diligently with HPD to ensure that all the required documentation for each property has been submitted, and it is exciting to see these nominations moving forward in the process! HPD staff will present information about the history and significance of each property to Review Board members, who will have an opportunity to comment and ask questions before voting on whether each property meets applicable National Register criteria. Following approval by the board, HPD staff will finalize each nomination before sending it to the National Park Service for listing. At this August’s meeting, six nominations will be presented. Among these are a cemetery, a house, a bank, and three historic districts. They are spread across the state, from Hall County to Glynn County. They encompass many different building types and styles, have a wide range of construction dates, and are significant for a variety of reasons. To help readers get more familiar with these nominations, we’re continuing our traditional pop quiz format. So without further ado, let’s get started! 1. The Peachtree Center Historic District is being nominated for its association with the civil rights movement in Atlanta and the innovations in architecture and community planning & development of which Atlanta architect, known for his atriums and sky bridges? 2. The Dixville Historic District in Brunswick consists almost entirely of houses, but there are a few non-residential resources. The most distinct of these non-residential resources is which of the following? 3. The Georgia Industrial Home is composed of six contributing buildings situated on 159 acres near Macon. The facility utilized cottages to house its residents rather than the institutional-type housing typically provided during this era. This facility was founded in 1899 to serve which population? 4. The Trust Company of Georgia Northeast Freeway Branch was built in 1962 alongside the highway, promoting car-centric “motor banking” and taking advantage of the rapid suburbanization of Atlanta. These things convey the bank’s significance in the areas of commerce and community planning & development. The bank is also significant in the area of architecture as an excellent example of which architectural style? 5. Originally part of a country estate on the outskirts of Macon, the James and Olive Porter House was designed by architect W. Elliott Dunwody, Jr., and represents the French Eclectic style. The Porters were inspired to commission the house after their time traveling through the French countryside. Which of these elements of the house are representative of the French Eclectic style? 6. In addition to its association with early settlement in Hall County, the Friendship Baptist Church Cemetery is also significant in the area of art for its collection of grave markers. The markers found here are representative of early 19th to mid-20th century markers in church cemeteries of Georgia. Which of these symbolic motifs is not found in this cemetery? If you would like to find out more about this interesting group of nominations, check out HPD’s website and plan to learn about them in person at the Review Board meeting on August 25th. We hope to see you there! July has always been my favorite month – a fact that has often been met with a dose of disbelief from my peers, who harbor a very understandable disdain for the heat and humidity of Southern summers. But for me, summer means the plants I have been watching since early spring are in the height of production. Each morning, even before coffee, I bolt outside to inspect any minute sign of growth, new leaves, and new buds - and to diligently pick away snails and hornworms. As an archaeologist, it is easy to wonder about the history and origins of our hobbies, especially one as popular as plant cultivation and gardening. Archaeologists have published fascinating work on the origins of plant domestication in eastern North America, and have discovered that the earliest domesticates include Cucurbita pepo (gourd or field pumpkins), Helianthus annuus (sunflower), Iva annua (marshelder), and Chenopodium berlanddieri (chenopod). Work from seven archaeological sites across the eastern United States has provided enough information to determine that domestication of these plants began around 5,000 years ago, during the Late Archaic period. The cucurbita pepo gourd, marshelder, and chenopodium, which is closely related to quinoa, are all considered floodplain “weeds” that thrived in open and disturbed river valley landscapes as a result of spring floods, and the stabilization of these landscapes during the Mid-Holocene was necessary in order for plant domestication to occur. Today, C. pepo var. 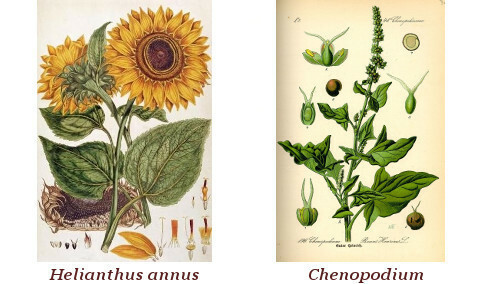 ovifera gourds and H. annuus sunflowers remain staples of modern gardens, and it is fascinating to consider the relationship between people and plants over the span of the past five millennia. Archaeologists have also theorized about the ways plant domestication may have altered the division of labor at the household level, influenced changes in tool manufacturing, or contributed to more sedentary societies. In addition to understanding societal changes, it is fun to wonder whether our counterparts 3,000 to 5,000 years ago were out first thing in the morning inspecting, with a sense of fascination, all the minor changes in their household garden plots. The Fox Theatre Institute (FTI) announced in July that the deadline for its annual Preservation Grant will be extended to August 15th. For more information visit the FTI grant website. In July, Fairburn Mayor Mario Avery issued a proclamation honoring local soldiers of World War I and recognizing the city’s distinction as being the first to erect a permanent monument to World War I soldiers in Georgia. This commemoration is one of many such events around the nation marking the Centennial of the United States entrance into WWI. The Fairburn monument, located in Holly Hill Memorial Park cemetery, was built by popular subscription in 1918 to honor the local young men —white and black — who were killed in battle, died in camp, died in service or were wounded in battle. This memorial, known as the Campbell County Soldier Boys monument, also recognizes this county as the first in Georgia to draft its quota of soldiers for the Great War. Local officials praised the monument for also listing the African American soldiers among the 25 names of dead or wounded military personnel in spite of segregation, which was legal at that time. Campbell County merged with Fulton County in 1931. For more information about Georgia’s WWI Centennial commission, visit worldwar1centennial.org/georgia-ww1-home-page. Whatever happened to that Confederate shipwreck being excavated in the Savannah River? Head to the Coastal Georgia Center Auditorium to learn about the latest discoveries from the final excavations and preview of “Dredging Up the Past: Recovery of the CSS Georgia Shipwreck,” the film documentary about the project. The evening begins with a light reception at 6:30 p.m., followed by a presentation and the film at 7 p.m. In this documentary, by award-winning filmmaker Michael Jordan, renowned underwater archaeologists Stephen James and Dr. Gordon Watts present up-to-date details on recovery of the Confederate ironclad, and highlight the numerous and amazing artifacts discovered. Sponsored by the U.S. Army Corps of Engineers, Savannah District, this event is free and open to the public. For more information, contact the Corporate Communications Office at (912)-652-5279. The Georgia Historical Society, in partnership with Savannah area sites, will open free of charge for "Lift Every Voice: Savannah's African American Historic Sites Free Day." The event is being held to mark the recent opening of the Smithsonian Institution’s National Museum of African American History and Culture (NMAAHC). Seven local sites are collaborating to honor Savannah’s African-American history. Sites open for the day include Beach Institute, Davenport House Museum, Georgia State Railroad Museum, Ossabaw Island Foundation, Pin Point Heritage Museum, and Telfair Museums’ Owens-Thomas House. Programs at each site will focus on African-American history connections and will include a variety of activities for guests of all ages. The event will take place from noon to 4 p.m. For more information visit the event website. For the first time in nearly 40 years, Georgia will be in the path of a total solar eclipse. On August 21, several Georgia State Parks and Historic Sites are hosting events to celebrate and view the event. See the State Parks and Historic Sites website for details. The next Historic Preservation Commission Training, hosted by the Historic Preservation Division, will be held in conjunction with the Georgia Downtown Conference in Columbus, Ga. on August 22. The training program and registration information are located on the HPD website. The Georgia Historic Preservation Division will be partnering with Wormsloe Historic Site to host a public archaeology day on September 23 from 10 a.m. to 2 p.m. Visitors are encouraged to come learn about Wormsloe’s past and help archaeologists in the field. TITLE IMAGE: Train Depot in the National Register-listed Toccoa Downtown Historic District. Toccoa was one of seven Georgia municipalities to receive a Historic Preservation Fund Grant in 2017 to support preservation activities in the community.